Multi-format Embroidery Design Pack on CD. 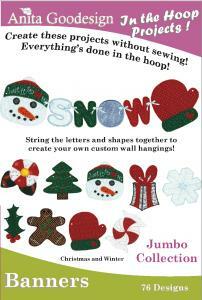 String the letters and shapes together to create your own personal banners or wall hangings. Whether it's a birthday party, bridal or baby shower, graduation or holiday, you are sure to find the right design for your celebration in this great collection! All designs are created in the hoop with no additional sewing required. Say it big, say it proud and say it loud with banners!